The arrival of the first Rolls Royce Wraith on American soil is slated for July 13, to begin its cross-country visits to local dealerships where aficionados will have the chance to ride in and drive the powerfully plush vehicle. The recognized dandy of the road hides some impressive digits beneath its eloquent raiment. Its earth shaking V12 engine develops 642 bhp to propel the exotic car in a wraith-like zero to 60 of 4.4 seconds. At 1,500 rpm it develops 590 ft.-lb. of torque. When it debuted at the New York Auto Show this year, the Wraith became most powerful, and possibly the most gorgeous, Rolls-Royce ever to bear the famous Spirit of Ecstasy flying lady hood ornament. The striking new fastback silhouette is designed to bring new customers to the brand, adding a new chapter to a richly storied 109-year history. The vehicles exterior is further enhanced by the striking new inset grille and the wide stance of the rear wheels. "I am delighted that we are introducing the highly anticipated first Rolls-Royce Wraith," commented Eric C. Shepherd, Regional Director for North America for Rolls-Royce Motor Cars. "Rolls-Royce is a brand defined by British hand-craftsmanship, rooted in the highest measures of luxury, quality and attention to detail. Our discerning clients will be lulled by the car's performance and agility, both of which will deliver on the promise of dramatic exterior styling." 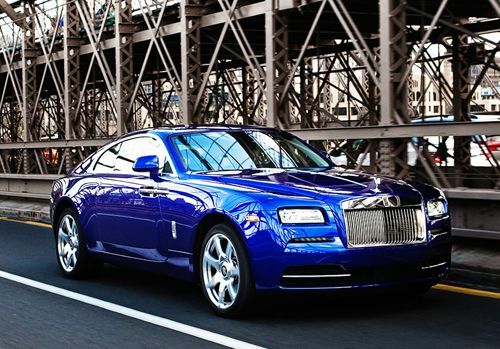 To fulfill the kind of amenities those clients expect from Rolls Royce, the Wraith provides Satellite Aided Transmission, which scans the road ahead with GPS mapping, assures the correct gear is engaged for smoothly unimpeded forward motion. Telematics are accessed via voice command, connecting the driver to a virtual onboard valet system. The roomy four occupants seating is appointed in a wildly luxuriously contemporary ambiance, any yacht would be happy to call its own. The twin-turbocharged V12 engine is hitched to an 8-speed automatic ZF transmission providing smooth acceleration that can be applied aggressively when want or need invoke such action. The all-new Rolls-Royce Wraith with its lower roof height, raked windscreen and gracefully arced rear deck is probably the most aerodynamic ever built. The suspension has been tuned to minimize body roll and discreetly amplify feedback when cornering, providing the dynamics of a sports sedan in s full size touring car – even though the Wraith has a shorter wheelbase than its kindred family of cars. Another awesome feature is speed sensitive steering – the wheel is heavier at high speeds and lighter at low speeds providing a polished, spirited driving experience. Even though the Wraith provides spirited performance and handling, you will not feel the roads blemishes as the suspension places a billowy cloud between the road and the chassis. You will only feel what you need to know about the road – let the highway department worry about the rest. "By sensationalizing a feeling of adventure and innovation, we believe Rolls-Royce Wraith would be the chosen vehicle of our great founding forefather, The Honorable Charles Rolls, if he were alive today," commented Torsten Muller-Otvos, CEO Rolls-Royce Motor Cars. "The United States was built on its pioneering spirit, which is why I believe that this market will be Wraith's most enthusiastic in the years ahead. I look forward to welcoming more new customers to the Rolls-Royce family." The US Tour of the Rolls-Royce Wraith begins Saturday at the Beverly Hills CA dealership and continues cross country with the final stop in Ft. Lauderdale FL October 4. If there’s a Rolls-Royce store near you, check in for your chance to drive a newborn legend yet this summer.